TALLAHASSEE, Fla. – The honors keep rolling in for the Florida State track & field teams on the heels of their breakout indoor season, which was highlighted by a pair of ACC Championships, a return to the Top 25 and 10 Noles earning All-American honors at last week’s NCAA Indoor Championships. 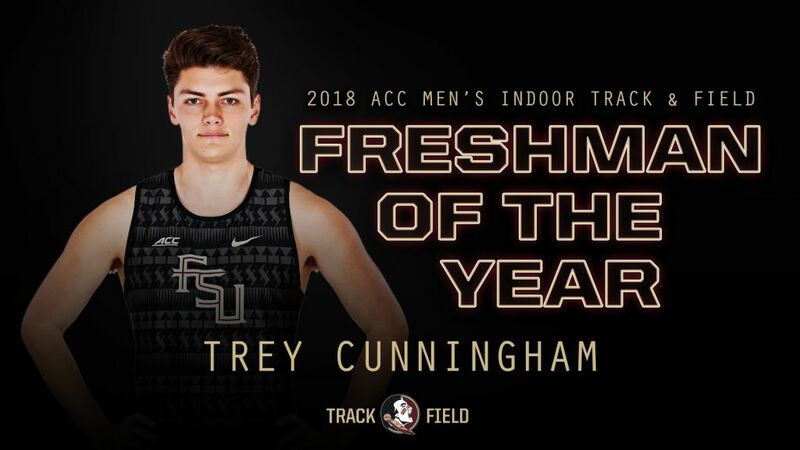 In a vote of his peers, Florida State coach Bob Braman swept ACC Coach of the Year honors for men and women, while hurdles sensation Trey Cunningham was selected ACC Men’s Indoor Track & Field Freshman of the Year. Those honors were announced Friday morning by the ACC office. Cunningham followed up his ACC 60-meter hurdles title in a season-best time of 7.70 by placing sixth at the NCAA Indoor Championships. The Winfield, Ala. native, who came into the NCAA meet as the No. 7 seed, extended the Seminoles’ streak of scoring finalists in the event to 10. He closed the year as the fastest freshman in the nation. Just like his teams authored the third sweep of ACC men’s and women’s team titles, Braman also collected his third sweep of Coach of the Year honors. There have only been six sweeps of the team titles in conference history and the Noles have recorded the last three (2009, 2014, 2018), all under Braman’s watch. In the process of collecting ninth and 10th ACC Indoor honors, Braman now owns 21 Coach of the Year honors in the conference, which includes men’s and women’s outdoor track & field and men’s cross country. The 2018 season was remarkable on a number of fronts for the FSU indoor teams, who returned to the top 25 after a three-year hiatus. The men carried a No. 7 national ranking into the NCAA Championships, while the women were No. 25. The Seminole men held off defending champion Virginia Tech by a 111-107 margin for the programs’ 11th team title on Feb. 24 at Clemson; their first since 2014. In addition to Cunningham, Austin Droogsma (shot put), Kenneth Fisher (long jump), Edward Clarke (60) and Andre Ewers (200) claimed individual event titles. FSU’s women outscored runner-up Virginia Tech 91-81 for the third ACC crown in program history behind victories from Jayla Kirkland (60), Ka’Tia Seymour (200) and a slew of second, third and fourth-place finishes. Seymour, a freshman, was named ACC Women’s Track MVP for the meet, while Armani Wallace claimed ACC Men’s Field MVP honors. Combined the two teams produced 28 All-ACC performers, including 19 first-team selections, and led all conference schools. Syracuse’s Justyn Knight and NC State’s Elly Henes were honored as the Track Performers of the Year, while NC State’s Josh Davis and North Carolina’s Nicole Greene claimed Field Performer of the Year honors. Virginia Tech’s Lisa Gunnarson was the ACC Women’s Freshman of the Year.